This activity aligns well with any St. Patrick's Day activities you may do. Students work together to build a collaborative poster with their own original writing. Great for door display or bulletin boards! 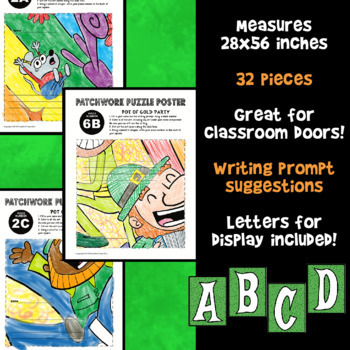 - 32 puzzle pieces with a place for students to write a response to a writing prompt of your choosing (ideas included). - Coordinate grid to guide student in creating the puzzle. - Original art by Mark Mariano. Check him out here! No stock clip art here! Like this? Get two more collaborative posters here! 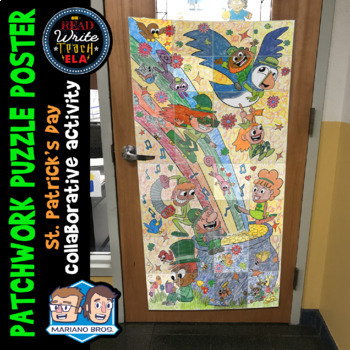 Patchwork Puzzle Poster: A New Year's Collaborative Activity and Patchwork Puzzle Poster: A Martin Luther King Day Collaborative Activity.